There wasn’t an empty seat inside Anaheim city council chambers and its adjacent spillover room last night. A line of people formed outside waiting to get in. More than half-a-billion dollars in subsidies were at stake for three Anaheim Resort District luxury hotels, including a 4-Diamond proposal by Disney, the latest in a series of massive giveaways before the coming of single-member districts in the November election. The council meeting promised to be excruciatingly long. Forty people filled out speaker cards for public comments followed by ninety more slated during public hearings on the three hotel deals. Tait limited the speaker time to 90 seconds to make things somewhat bearable. The mayor’s own time was limited; he had to catch a red-eye flight at 10 p.m. to visit the White House, where President Barack Obama invited him and others to talk police shootings and community relations today. An 8-hour council meeting followed that left many yawning and red-eyed themselves. City staff spoke in favor of the deals in cold, technocratic tones. Despite being a tourist haven, they blah-blah-blahed, Anaheim only had two 4-Diamond hotels, compared to 30 in Orlando, where the Mouse has a bunch of theme parks. 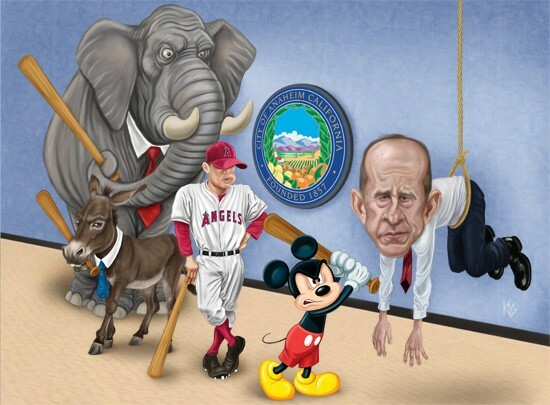 Approving the subsidies, the presentation insisted, would flood Anaheim’s general fund with an infusion of bed-tax revenue. Hoteliers found a staunch ally with trade workers this time around, helping to seal the deals. Speakers from the following labor organizations and unions took to the podium to support the subsidies: The Los Angeles/Orange County Building & Construction Trades Council, Southwest Regional Council of Carpenters, Teamsters, International Brotherhood of Electrical Workers Local 411, Ironworkers Local 433, Carpenters Union Local 803, Anaheim Firefighters Association 2899, Anaheim Police Association and more! Helping the rich get richer with tax breaks, trade unions negotiated a Project Labor Agreement (PLA) with all three hotel developments. Here’s how it works: The first 20% of union construction jobs go to Anaheim residents. The next tier recruits union laborers in a 15-mile radius. There’s a built-in preference for local hires and veterans, especially with the Helmets to Hardhats initiative. The PLA won big praise from Democratic Party officials, including State Assembly Speaker Anthony Rendon and Henry Vandermeir, chair of the Democratic Party of Orange County. Only the slightest union dissent came courtesy of Unite Here Local 11, but just against Anabella and Good Hope deals, both affiliates of Wincome Group. “There’s no commitment to union jobs for hotel workers,” Unite HERE political director Derek Smith said of them. The negotiated labor agreements don’t include card check neutrality for future low-wage hotel service workers. Disney, on the other hand, will be unionized, rendering criticism of the largest hotel subsidy in Anaheim’s history mum. Councilwoman Kris Murray chided Unite Here for coming to the negotiating table too late, noting that the trades got it done. Hey trades, whatever happened to that old union ideal of solidarity, especially when construction is largely white, male and better paid while hotel service work is largely immigrant, Mexican, female and lower paid? Hard hats and fat cats snickered and chuckled at the impassioned pleas. Mayor Tait mounted his best defense, offering a slide presentation tearing down the claims made by Support Our Anaheim Resort (SOAR) members in the lead up to the vote. They sent out mailers and published an ad in the city’s magazine to combat the “Stop Disney” social media blitz by the anti-subsidy camp. Tait compared 3-Star and 4-Star 500-room hotels, claiming that less-luxurious lodging without tax breaks would contribute 2.67 times as much revenue. 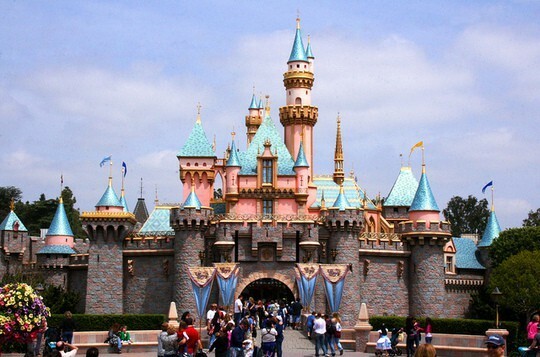 “The 3-diamond is better over the next 20 years for the people of Anaheim,” Tait said. He moved next to call into the question the need for subsidies, quoting Atlas Hospitality Group President Alan Reay saying that the hotel market is the best its been in 25 years. Tait wondered aloud if the land would really remain vacant for 20 years with the prime resort parcels at play and Star Wars theme park addition to Disneyland on the way. “This is a straight-on gift of $550 million,” Tait said. But the mayor ran out of time, needing to catch his red-eye. “We can carry on without you,” councilwoman Lucille Kring said. “Sir, we have 10,000 jobs and our entire agenda of city business before us tonight,” Murray added, pretending to be a champion of the workers. “There’s no rush to this, the earliest these hotels will be built is 2019,” Tait said. He made a motion to continue the vote until next council meeting in two weeks, pledging to cancel a vacation in order to be there for it; the council majority of Murray, Kring, and Democrat Jordan Brandman rebuffed him in a 3-2 vote. The gavel turned over to mayor pro tem Kring who questioned Tait’s presentation, stating very few 3-Diamond hotels have 500 rooms, rending the comparison to one of apples and oranges. Without Tait at the helm of dissent, councilman James Vanderbilt fumbled through his line of questioning. The Good Hope hotel subsidy passed by a 3-1 vote to the thunderous applause of hard hats and fat cats. Disney followed next. The last of the subsidies for Anabella’s Resort Hotel passed deep into the midnight hour while most of Anaheim slept.